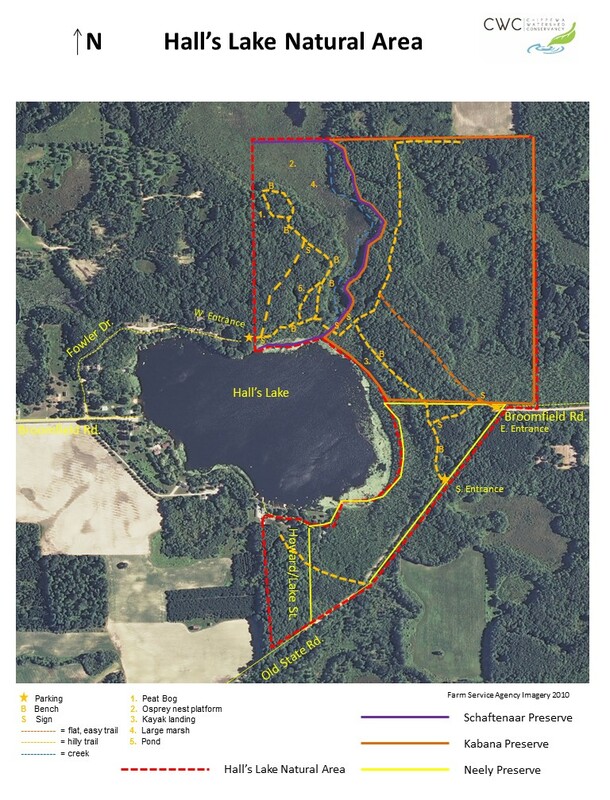 The Hall’s Lake Natural Area is a combination of three Chippewa Watershed Conservancy (CWC) preserves and privately-owned land that comprise a buffer along the entire eastern half of Hall’s Lake in western Isabella County. A nine-acre parcel of land on the south end of the lake, west of Howard Street, is owned by Adonna and Steve Kennedy. It includes a short length of trail that links up with the CWC’s Neely Preserve. The Kennedys allow the public to access their parcel. The Harry E. “Gene” Neely & Olga Shiraef Neely Preserve is a 26-acre parcel of land beginning along the east side of Lake Street and continuing between the lake shore and Old State Road to its intersection with Broomfield Road. The Kabana Preserve is bordered on the west by the 33-acre Schaftenaar Preserve, which continues along the lake shore to the end of Fowler Drive on the north end of Hall’s Lake. A seven-acre parcel of land west of the Schaftenaar Preserve is owned by Larry and Judy Schaftenaar, and includes more trails. The Schaftenaars allow public access except during the deer season. The Hall’s Lake Natural Area totals 175 acres, all of which were once owned by the John and Betty Kabana family. For a downloadable map showing the trails, click here.